The Thermo Forma Steri Cycle 370 is a reliable CO2 Incubator which removes airborne contaminants in real time with a built-in sterilization process that uses high temperature rates. The stainless steel chamber designed with HEPA air filtration system eliminates particles safely keeping your cell cultures in a cleanroom environment. The Thermo Forma 370 CO2 Incubator is ideally suited for those difficult tissue culture assays needing a sterile environment. The Steri-Cycle runs at 140°C during the sterilization cycle with a few simple pushes through the control panel and runs for a duration of 12 hours or less. The Thermo Forma Steri Cycle 370 controls are situated in the front of incubator allowing the researcher to easily access them at any given time. The chamber of the incubator is built out of polished stainless steel and designed to optimize airflow while keeping the environment in a class 100 condition. In addition to comfort, the Forma Steri-Cycle 370 comes equipped with built-in alarm systems alerting the user of any variances in temperature. The incubator has a maximum capacity of 184 liters and operates on 115V power at 9.6 amps. The temperature stability of the Steri-Cycle 370 is ± 0.3°C with relative humidity of ambient to 95% at 37°C. 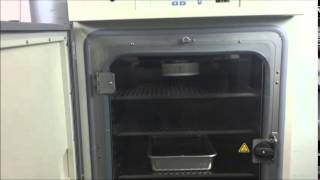 Contact The Lab World Group with about our Thermo Forma Steri-Cycle 370 CO2 Incubators. Each unit comes fully calibrated to factory specifications. The Thermo Forma Steri Cycle 370 Incubator has been fully inspected and is ready to ship. All of our lab equipment comes backed with our standard warranty. Should you have any questions, please don't hesitate to contact us.